A handful of Fargo residents have voiced concerns about our Red River beavers and their activity, but what some may view as destruction is actually very beneficial environmentally. Beavers are considered a keystone species, meaning that they are essential for a healthy and balanced ecosystem. While most Fargo residents seem to enjoy the productive little critters, others are labeling them as "destructive" and "pests". Attaching a negative stigma to such an important animal is dangerous and unfair. Using such damaging words to describe these animals not only hurts the beavers and all the lifeforms that beavers support, but ourselves as well. When beavers take down older trees, it allows for the sun to reach the ground below the tree and helps various other types of plants and trees to grow. While we might not appreciate the beavers taking down specific trees, there are solutions that are proven to work that can protect those trees without harming any other life. Fencing, tree painting, and repellents can be effective ways to prevent beaver activity. Some communities have found alternatives to destroying beaver dams, such as designing a PVC pipe drainage system that goes under and through unwanted dams. When beavers build dams, they are trying to prevent water from leaving their habitat. Sometimes this can cause flooding, but usually beaver dams are beneficial to many kinds of species. 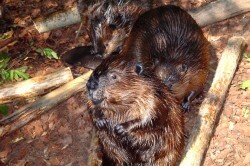 Beaver dams contain water in one area, which creates wetlands. Dams help filter water, improve water quality, trap nutrient-rich sediment that provides nourishment for some animals, and slow water flow, allowing life downstream to flourish. You will find a larger variety of flora and fauna where there are beavers, as many of these species rely on beaver activity. While it may seem that using lethal traps is the easiest and cheapest way to deal with beavers, it is cruel and ineffective. There is no way to prevent other types of animals who are not targeted from ending up in the trap instead. Also, chances are the beavers in that area are already pretty well established. It is better to leave the already established animals in the area than to disrupt the balance there. Beaver culling can actually stimulate their population, and rogue beavers may move into the area and try and establish their own territories, taking more trees to build their own dens. If we see destroying animals as the solution to our problems, we learn to see other animals as enemies instead of important members of our environment. We detach ourselves further from the interconnectedness of nature. We lose our understanding of how nature works and we put our own trivial needs and desires above all other forms of life. We forget that all life is interdependent, as if we were removed from the cycles of life; as if the human species can do no wrong, as long as someone is turning a profit. As if other animals are responsible for all the destruction on this planet and human actions are somehow pardoned because we believe we are entitled to everything the Earth has to offer. It's up to us to cohabit in a peaceful manner so that we may learn how we can benefit each other. This May, the Beaver Backers of Fargo will be gathering in a community conservation effort that will allow us to protect the beavers while protecting certain trees from beaver activity.